Sir Isaac Newton is considered by some to be the most influential man in the history of science, more so than even Albert Einstein. Newton was born in England, spent many of his years living there, and also eventually died in the country. But during his living years, Newton accomplished so much. He contributed so much to science that some historians say that he significantly progressed ever field that he ever studied. Now that is some compliment. Sir Isaac Newton is believed to have developed the the study of Calculus. Although both were studying similar things, they both went about it from two very different approaches. They also used very different notation. 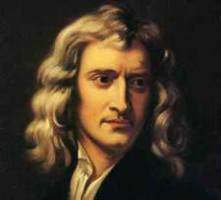 Newton contributed much to the field of mathematics that few will ever even understand. Some of those contriubtions include Newton's identities, Newton's method, and the generalized binomial theorem. He also layed the groundwork for what eventually becaome Euler's summation formula. In short, of all the famous math people the world has ever known, Sir Isaac Netwon might be most influential mathematician. Second Law: The equation F = ma, where m is the mass of the object, F is the net force, and a is the acceleration. Let's take a closer look at Newton's First Law. It states that "an object in motion, stays in motion." Consider this example: Hold a bouncy ball waist high and then drop it. What happens to the ball? When you drop it, the ball is in motion - but does it stay in motion? Of course not, we know that eventually the ball will stop bouncing. Does this mean Newton's First Law is incorrect? Of course not! Read the last part of the law... "Unless and external force acts upon it." Now I know that YOU did not act upon the ball, but another external force did. Guess what that force was? Yup, that's right - Gravity! Gravity pulls the ball back down to earth, eventually making it stop. Return from Sir Isaac Newton to other Famous Math People.